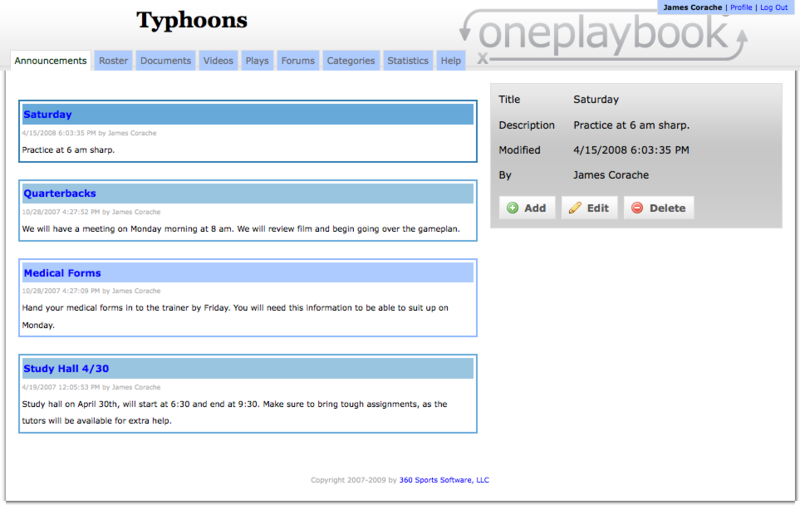 With the OnePlaybook sports software package, coaches have a new and unique way to communicate with their players. Normally, a phone list, an email list or handouts might be the way a coach would contact his players and give them important information. Now, a modernized sports coach can leverage the communication features in our sports software to get that information to them faster and easier by using announcements. The first page a player or coach sees after logging into the sports software. When a coach or player first logs into OnePlaybook, they are immediately brought to the team’s Announcements tab. 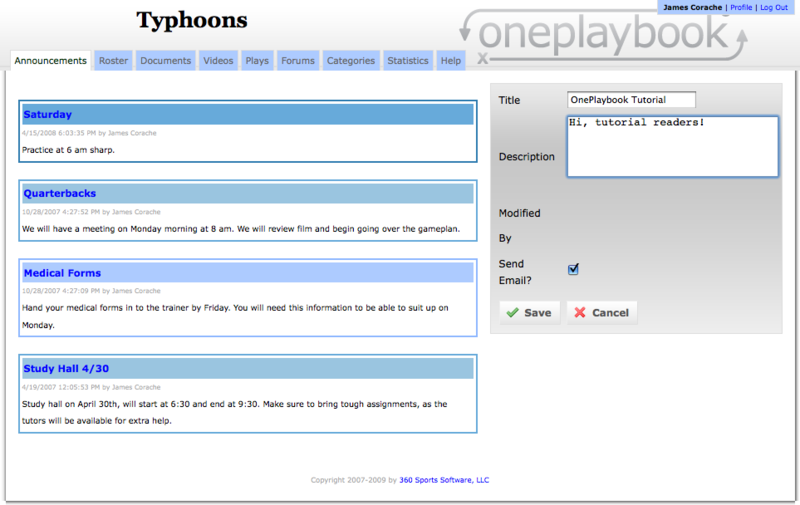 Here coaches can add, edit or delete announcements, allowing him to put important information all in one place. Whether it’s a team schedule, practice updates, thoughts on the last game or a small pep talk, a coach has a central place for that information. The posts are shown with the most recent at the top so players know immediately when something has changed. For a coach to add a new announcement, he just presses on the Add button in the gray area. That gray area will then be replaced with a section for a coach to type in a title for the announcement as well as the announcement itself. After pressing on the Add button, a coach can type in his announcement to his team. 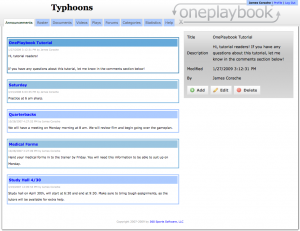 In addition, a coach can send that announcement as an email as well as posting it on his or her OnePlaybook account. All the coach has to do is check the checkbox below the areas with the typed announcement. This just gives another way for coaches to make sure that their players are always up to date. The page is immediately updated with the new announcement. The coach can now press the Save button and the announcement will be posted. The announcement is posted right away, so if a player is logged into the team’s personal OnePlaybook site, when he or she goes to the Announcement tab, he or she will instantly see that new announcement. Announcements make it easy for coaches to use their sports software to quickly get in touch with their players.